We were delighted with our stay at El Greco apartments! The host Gratzia was kind enough to be up to meet us at 2am and let us in. The room had much more than we needed which was fantastic. It had a washing machine which we really needed during that part of our stay. We could also hang our clothes outside. The room was lovely and decorated in the greek blue and white colours. The bathroom was simple but big for the room. The terrace upstairs had a view of the whole Skala on both sides. It was delightful to have breakfast there and to talk with Gratzia while watching the view. The internet connection was also best up there which we didn't mind. There are also 2 dogs and a cat which roam around from time to time which made it even more like your own place. It really felt like a home which was lovely, we would return again. The host and his wife were extremely friendly and helped out whenever we had questions. Close to Patmos ferry port. Immediately one feels part of the community. Breakfast on upstairs balcony overlooking the town and port. Very generous hearted host. Washing machine! Living spiritual experiences hosted by Grazia and Stylianos, thx 2 both. very very nice and good people from Patmos. Do not miss any of the best breakfast U ever had. God bless U, and your family 'tigers included' :) Efjaristó!! Wonderfull and unique location of the appartments, with a roofterrace overlooking the whole town of Patmos, the harbour, and a fantastic sunset. Location in the town is only 5 minutes walk from the port and the centre. The loving and caring service by Gracia (e.g. the breakfast on the roofterrace) and by Stellios (e.g. 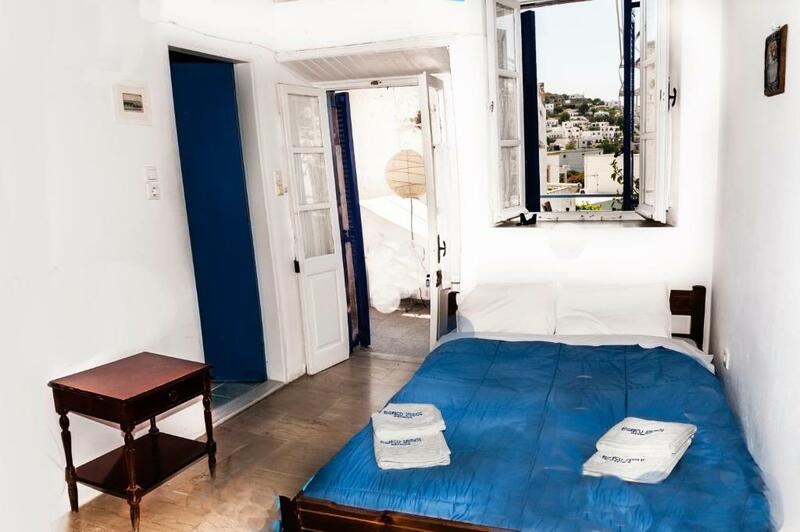 the suitcase transportation to the roof-studio) has made our stay in El Greco unforgettable! I spent 6 wonderful days on the Isle of Patmos! In October, it was very few tourists and the whole island was at my disposal! I swam, walked around the island and local attractions almost all alone! And it was great! Living in EL Greco Studios I felt at home! The room was cozy and it had everything we needed: fridge, stove, kitchenware, washing machine! The Breakfast was on the terrace overlooking the sea, the mountains and the monastery of St. John the Evangelist! The hostess was very sweet and helpful! The apartment is located near the port and centre of Skala! Really enjoyed it! Stelio's (the owner) attitude, very detail-orientated, a rarity in Greece that you should know if you traveled it extensively as I did, so that the room, even if not the biggest you can get for that budget, had everything you need. And his pro-activity in helping you without seeking any extra compensation. A quirky b&b, with a very friendly family atmosphere. It is in a quiet side street a few hundred metres from the port. The hosts could not have been more helpful. The landlord picked us from the port and he was helpful and communicative.also he provided bikes to us for free. Lock in a great price for El Greco Studios – rated 8.7 by recent guests! One of our best sellers in Skala! 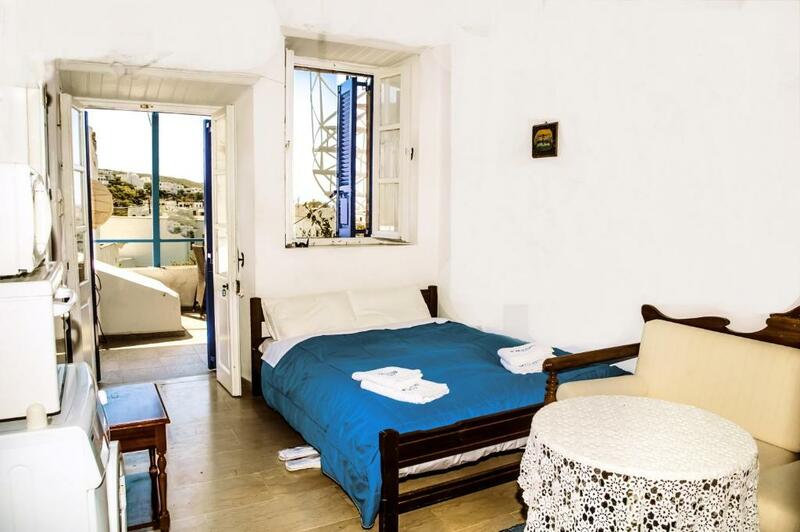 Offering rooms with free WiFi, and a rooftop terrace with views of the sea, El Greco Studios are set in a traditional 15th century building just 500 feet from Skala’s port and Patmos Town. 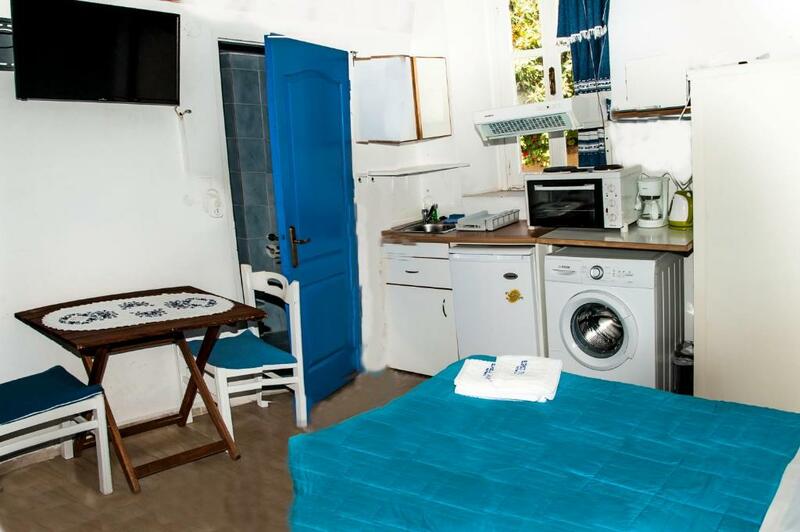 El Greco’s air-conditioned rooms have a kitchenette with a mini fridge, microwave oven and coffee maker. Each is further equipped with a satellite TV and DVD player. All guests have access to the communal laundry room. A washing machine is also featured in your room. Breakfast is served on the rooftop terrace with views of Chora and the port and includes honey, cakes and eggs. The property can inform guests about cultural events and offers Patmos island souvenirs. Free bikes are also available, while discounted rates are provided at the nearby gym. El Greco Studios lies within 3,100 feet from the Cave of the Apocalypse and 1.2 mi from the famous monastery of Patmos, which dates back to the 11th century. Car and motorbike rental services are provided upon request. 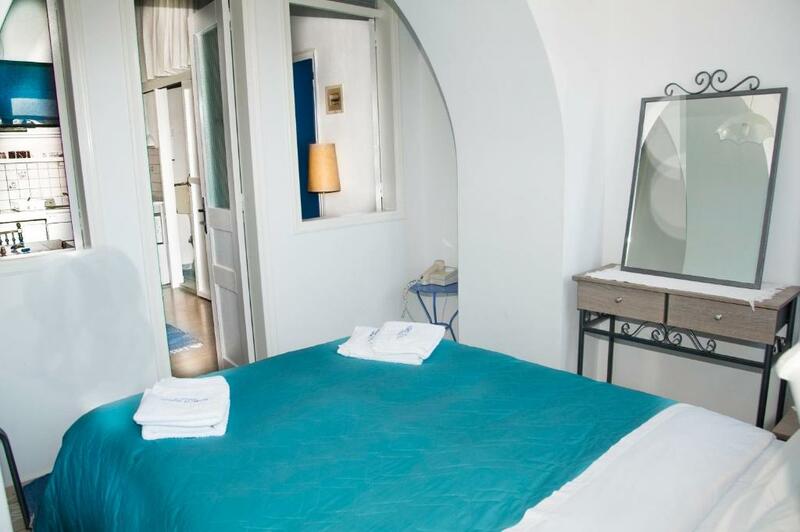 When would you like to stay at El Greco Studios? Air-conditioned studio enjoying Aegean Sea views from its balcony. It comes with well-equipped kitchenette, a satellite TV and DVD player. All guests have access to the communal laundry room. A washing machine is also featured in your room. Please note that baby cots cannot be added in this room type. Please note that this studio is located on the 3rd floor of the building and is only accessible by stairs, as there is no elevator. 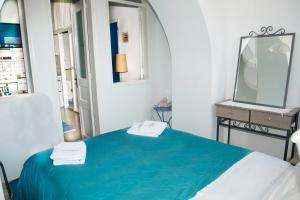 Air-conditioned studio with well-equipped kitchenette, a satellite TV and DVD player. All guests have access to the communal laundry room. A washing machine is also featured in your room. 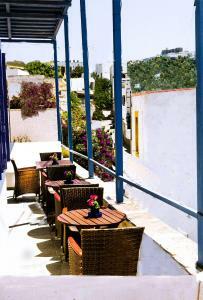 Air-conditioned apartment with well-equipped kitchenette, a satellite TV and DVD player. All guests have access to the communal laundry room. A washing machine is also featured in your room. Please note that this apartment is located on the 3rd floor of the building and is only accessible by stairs, as there is no elevator. This quiet, air-conditioned studio opens to balcony with garden views. It has a flat-screen, cable TV with DVD/CD player and a fully equipped kitchenette. This triple room has a seating area, mountain view and tile/marble floor. 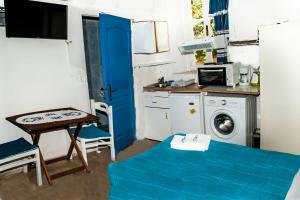 This double room features a electric kettle, air conditioning and washing machine. Kτηριο μεσαιονικο ενα απο τα πρωτα αρχοντικα που χτηστηκαν στην σκαλα(το λιλενα της πατμου!!! (1670) Με πληρες εξοπλησμο(ΔΙΕΘΝΩΝ ΠΡΩΔΙΑΓΡΑΦΩΝ) ΠΧ.πλυντηρια,42,πλασμα,ρουφ γκαρντεν,φουρνους,και,μικροκιματον,καπουτσινο,εσπρεσο,μηχανες,DVD,SATERLAIT,CHANELS.ΤΟΣΤΗΕΡΣ,ΟΛΑ ΤΑ ΣΕΡΒΙΤΣΙΑ,ΠΙΑΤΑ ΜΑΧΑΙΡΟΠΕΙΡΟΥΝΑ,πιστολακη μαλιον,βραστηρες,ασυρματο ιντερνετ σε ολω το οικιμα,ρεσεψιον 24Ωρες την ημερα χρηματοκιβοτια,υπηρεσια σιδεροματος ,ατομικο ,φαρμακειο,ξεναγεικση, στο νησι,δωρεαν ποδηλατα,ενοικιαση,μηχανακειον,αυτοκινητων,σκαφων αναψηχεις. Απο της πρωτες της Σκαλας,φιλοξενησε κατα καιρους το, τουρκικο προξενειο,καθως και, το ιταλικο, απο τους προτους, δρομους με κατευθηνση την χωρα,που και ακομα υπαρχει,με την ιδια μορφολογεια!!! House Rules El Greco Studios takes special requests – add in the next step! A EUR150 damage deposit is required 14 days before arrival (about USD168.65). This deposit will be fully refunded 7 days after check-out, as long as there isn't any damage to the property. El Greco Studios accepts these cards and reserves the right to temporarily hold an amount prior to arrival. Please note that the hotel offers free transfer from/to the port. Guests are kindly requested to inform the property in advance about their exact time of arrival, if they wish to make use of this service. Contact details can be found on the booking confirmation. Please note that buffet breakfast is served from 08:00-12:00. Please inform El Greco Studios of your expected arrival time in advance. You can use the Special Requests box when booking, or contact the property directly using the contact details in your confirmation. A damage deposit of EUR 150 is required. The host charges this 14 days before arrival. That's about 168.65USD. This will be collected by credit card. You should be reimbursed within 7 days of check-out. Your deposit will be refunded in full by credit card, subject to an inspection of the property. This property had a few minor small issues but since the host, location and value for money are great it is hard to complain! There are 3 steep flights of stairs inside the property to get to the main area of the rooms. The terrace is reached to by a narrow winding staircase so if special needs are an issue this isn't good. We had heavy luggage which was a slight issue but we did ok. Guests have to be prepared to climb three flights of stairs. We loved the extraordinary hospitality of our beloved hosts. Definitely recommended. The location of the hotel was very good. It is close to the center, the restaurants and the bus station. The hosts are very kind and helpful in every situation. The view from the terrace is very fine. It was my second time in el greco hotel. I will choose here again,definitely.